As we close the book on 2012 and stare at a blank slate for 2013, it’s O.K. to accept that not all things must change. Here at keithhirsch.com, we will continue to focus on early CDs. Sure, we’ve been doing that since 2007, but there are still a lot of interesting discs that have not gotten their due here. 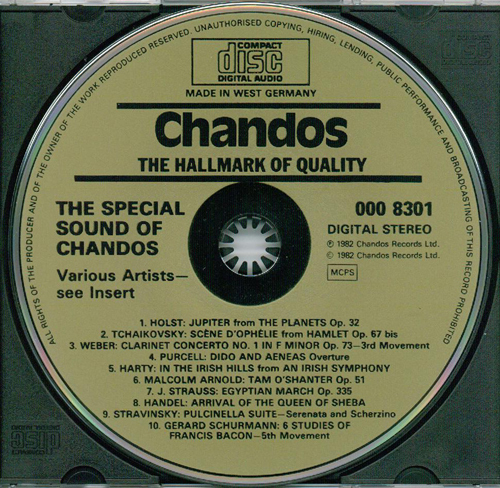 Enter a 1982 CD sampler from the British classical music label Chandos entitlted The Special Sound of Chandos. Like most other labels, Chandos prepared this sampler to promote their musicians and excellent sound on the new digital music format. The Special Sound of Chandos contains 10 selections from legendary composers such as Tchaikovsky, Strauss, and Stravinsky, performed by well-known British orchestras. The Special Sound of Chandos was pressed in West Germany by the Polygram plant and was released under catalog number 000 8301. Both the disc and accompanying inserts are dated 1982. The back insert does not have a barcode. While this sampler has the appearance of a promotional issue, there are no promotional statements on the disc or inserts. Thus, this sampler may have been sold at retail. Given that the catalog number ends in 8301, this may have been the first title produced on CD by Chandos. As it is dated 1982, it certainly is among the earliest Chandos CDs. Another indicator that this is an early CD is the label design. As with many other labels, Chandos used a solid paint coating for its earliest CDs pressed in West Germany. The Special Sound of Chandos has a bronze paint coating with black text. Later West German pressings on the Chandos label have black text with a red ring and red Chandos logo and no paint coating. The bronze-painted Chandos CDs are sought after by many collectors of early pressings. The Special Sound of Chandos is yet another early CD sampler that appears to be quite rare. Shown below is the cover, back insert, and spine label for The Special Sound of Chandos, along with the CD. The cover for the CD sampler The Special Sound of Chandos (Chandos, catalog number 000 8301). The back insert for the CD sampler The Special Sound of Chandos (Chandos, catalog number 000 8301). There is no barcode. The back insert is dated 1982 along the bottom. Note also that the insert was printed in West Germany. 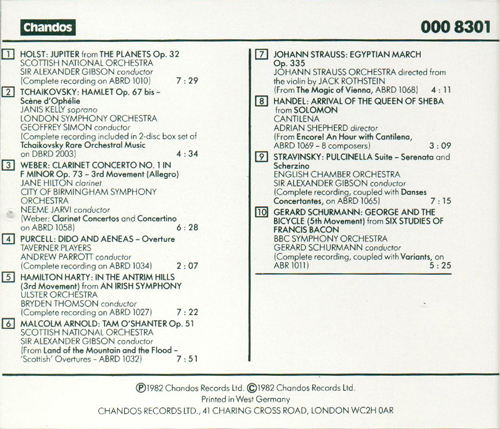 A spine label for the CD sampler The Special Sound of Chandos (Chandos, catalog number 000 8301). 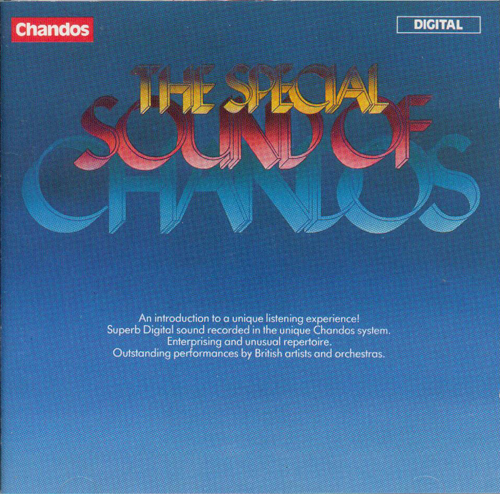 The CD sampler The Special Sound of Chandos (Chandos, catalog number 000 8301). Note that the disc states “MADE IN WEST GERMANY” beneath the CD format logo at 12 o’clock. The bronze paint coating only appears on the earliest Chandos titles pressed in West Germany. The matrix code is “CHAN 8301 2893005 01”.